Protective compound and powerful antioxidant found in red grapes. Associated with anti-ageing (preventing disease, reducing inflammation, lowering mortality). Resveratrol is a protective compound produced by red grapes (and certain other plants) as a defence against parasites. Many studies have demonstrated that resveratrol is a powerful antioxidant and that it protects human health through a number of mechanisms. Indeed, research attributes much of the health protection conferred by the famous French paradox' to resveratrol. The World Health Organisation suggests that resveratrol single-handedly reduces cardiovascular risk by 40%! Resveratrol is more effective than vitamin E, protecting against a wider range of free radicals to prevent oxidation of low-density lipoprotein (LDL). It inhibits platelet aggregation by blocking the action of thrombin and several other aggregating factors. It promotes production of nitric oxide which relaxes and dilates the arteries. It reduces blood triglyceride and cholesterol levels as well as the intrinsic hypertensive agent endothelin-1. Resveratrol is the only natural product with such strong evidence to show it stops cancerous cell development at various stages: a study published in the prestigious review Science' showed that resveratrol blocks the proliferation of cancerous cells during three important stages of development. A study in which mice were given resveratrol over 18 weeks showed a reduction in skin tumours of 98%! Resveratrol destroys cancerous cells whether or not they are either oestrogen-dependent, or have the gene, p53. An Austrian study showed that resveratrol prevented certain types of cancer from metastasising to bone. Other research has demonstrated that in some cases, it improved the results of chemotherapy. It can also block the cancer-promoting effects of a linoleic acid-rich diet. Unlike many drugs, resveratrol protects, rather than destroys, healthy cells. Its anti-cancer action is diverse, powerful and sophisticated. Preliminary studies suggest that resveratrol - administered singly, and in combination with other antioxidants - protects the brain against oxidative stress. Oxidative stress is known to play a major role in most neurodegenerative diseases. A Chinese study has recently shown that, when injected immediately after injury, resveratrol is as effective as the drug prednisone at protecting against inflammation of the spinal cord, but with additional benefit of antioxidant protection. A study of rats pre-supplemented with resveratrol for 21 days has shown that it improves the prognosis, and reduces the permanent effects of stroke. According to a study at Harvard Medical School, resveratrol activates a longevity gene in certain strains of yeast and extends life expectancy by 70%! It works in the same way as calorie restriction (the only scientifically-proven way of increasing longevity) by activating SIR genes. Research to date has been restricted to yeasts, flies and nematodes but it's worth noting that humans also possess these genes. Evidence from numerous studies confirms that resveratrol offers many preventive effects against premature ageing. To benefit from these anti-ageing effects, resveratrol can be taken as a supplement on its own or in antioxidant combinations such as in the formulations Resveratrol Synergy and AntiOxidant Synergy. 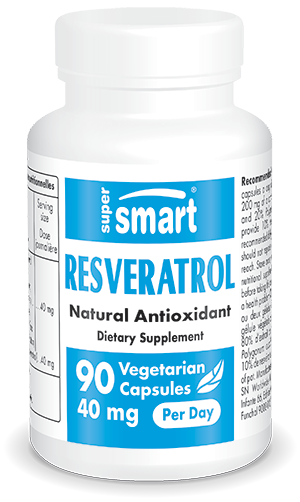 Each vegetarian capsule contains 20 mg resveratrol. Recommended use: Take one or two vegetarian capsules a day with food, or as advised by your therapist.